Over the last 30 years, China has gone through a period of unprecedented economic growth. Much of this economic development has occurred in cities and subsequently, vast waves of rural-urban migration have ensued. As a result, China’s urban population has doubled over the last decade and for the first time in 2011, the percentage of urban residents outweighed those living in rural areas. Such migration began in the late 1970s with the liberalization of economic policy and the “opening” of China to the world. Accompanied with the relaxing of the hukou  system millions of migrants rushed to the city in the hope of better futures. These migrations, however, were not uniformly distributed across the country. Certain areas received far higher levels of migrant workers such as the south-east and in particular Guangdong, which welcomed 35.4 million people between 1990-2010. This trend was predominantly down to the establishment of 3 special economic zones (SEZ) in Guangdong province. These areas adopted a particular liberal free-market economic policy with greater trade freedom and as such demand for low-skilled labor was high. 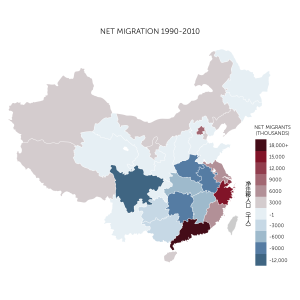 In more recent years (2008-2013) with the development of inland regions, migrants are now more able to find employment closer to their hometowns. Increased levels of job opportunities and lower cost of living have made these provinces more attractive to migrants. Of these “2nd tier” regions Hunan has experienced the greatest population growth with a 3.1 million increase since 2008. This is largely due to the presence of Changsha-Zhuzhou-Xiangtan City Cluster and Hunan’s targeted economic growth. The trend looks set to continue with the Chinese Development Bank (CDB) committing 85.3 million Yuan in 2013 to boost Hunan’s continued urbanization. Outlook to 2020 implies further growth of the country’s urban centers and will be driven by targets set out in China’s National New-Type Urbanisation Plan. Within this, more urban job opportunities will be created and investment in urban infrastructure targeted. An additional relaxing of the hukou system, so often a deterrent and risk to migration will permit registration by residence as oppose to birthplace. This reform allows individuals more rights in their place of work and will further drive freer movement of workers within China. Hukou is a household registration system issued per family, which identifies people as residents of a specific area. If you move out of your registered area the rights received to services such as education and healthcare are diminished. It can be looked on as an internal passport. China’s Landfills Are Closing: Where Will The Waste Go?